General histories listed on the page for Books about Angus & Kincardineshire, in particular Warden, vol. 2, pp. 345-365. 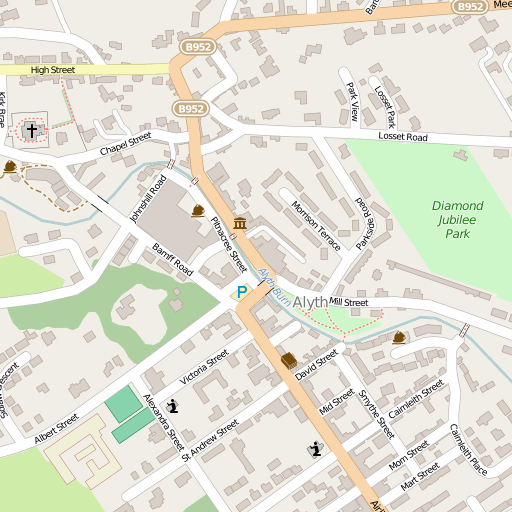 For the full range of maps of Alyth, see National Library's Maps. See Geograph.org: Alyth - recent photographs of Alyth. National Grid ref. NO2448. The ruined Old Kirk is located at National Grid ref. NO245488. There is an article, with photographs, on [Old] Alyth Parish Church in A Corpus of Scottish Mediaeval Parish Churches. Some history, details and photos of the present kirk are at Alyth Parish Church: History. William Ramsay 1817-1846 b. 14 May 1791, son of Wm R., min. of Cortachy; M.A. Aberdeen 1809; ord. 11 Sep 1817; d. 16 Apr 1846; mar. 1821 Mary, dau. of James McNicoll, factor; issue: Wm, min. of Guthrie; James, min. here; John; Stewart Grant; Alexr Keith; David Graham Drummond Ogilvy, min. of Closeburn; Geo. McRitchie; Mary Stewart; Eliza (mar. Alexr Henderson); Robt; Clementina (mar. Addison Newton, Arbirlot); Keith Davidson, shipowner, mayor of Dunedin N.Z. James Webster ?-1901-? B.D. ; b. 12 Oct 1863 Newhills ABD, son of James W.; mar. Annie M. --; issue: James M.; Annie F.
Anthony S. Aglew ?-1891-? b. ca. 1836 England; mar. Margaret E. --; issue: Margareta K.
Sir James Ramsay of Bamff, bart. The parish was confined to Perthshire from 1891. 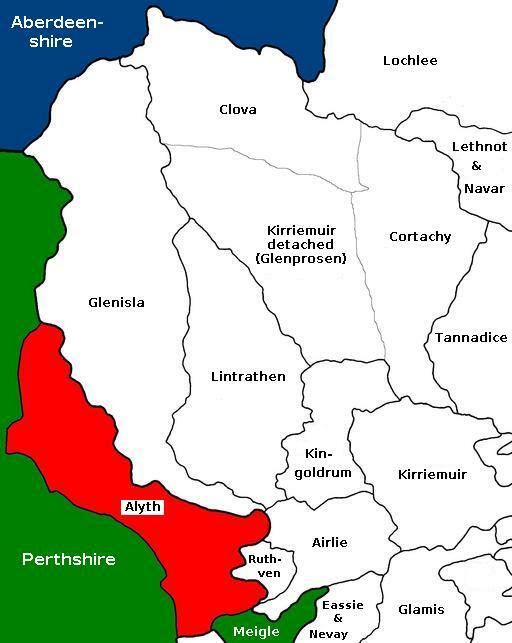 Alyth was in the Commissariot of Dunkeld [NRS CC7]. Old papers available on microfilm in the Local Studies Department of the A. K. Bell Library, Perth. See also this full list of papers and periodicals held at Perth.